Cremation is not final disposition of the remains, nor is some type of funeral service. Rather, it is a process of reducing the human body to bone fragments using high heat and flame. It depends on the weight of the individual. For an average size adult, cremation takes from 3 to 4 hours at normal operating temperature between 1,650 degrees F to 2,000 degrees F.
All bone fragments, which are very brittle, as well as inorganic metal items are swept into the front of the cremation chamber and into a stainless steel cooling pan. All non-consumed items, such as metal from clothing, artificial joints, and dental implants, are separated from the cremated remains. This separation is accomplished through visual inspection as well as using a strong magnet for smaller and minute metallic objects. Items such as dental gold and silver are non-recoverable and are commingled in with the cremated remains. Remaining bone fragments are then processed in a machine to a consistent size and placed into a temporary or permanent urn, selected by the family. Can multiple cremations be conducted simultaneously? Never. Not only is it illegal to do so, most modern cremation chambers are not of sufficient size to accommodate more than one adult. Thus it would be a legal as well as a practical impossibility to conduct multiple cremations simultaneously. An urn is not required by law. 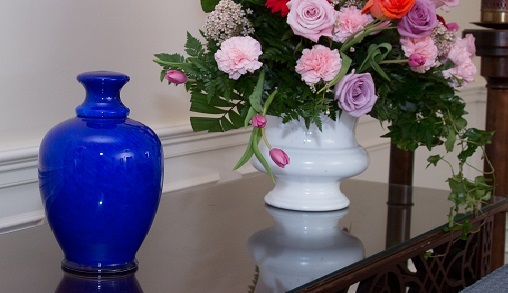 However, an urn may be required if the cremated remains are to be interred in a cemetery. 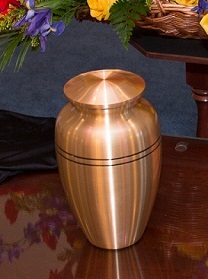 If an urn is not selected, the cremated remains will be returned in a temporary plastic container. No, a casket is not required for a direct cremation. An alternative container that meets state law requirements may be used. For certain circumstances, such as a public visitation or funeral service, a cremation casket may be necessary. Except in certain special cases, embalming is not required by law. Embalming is NOT required for a direct cremation. However, if you select certain funeral arrangements such as a funeral with viewing, embalming may be necessary. Yes, immediate family members may briefly view/identify the deceased prior to cremation. However, under certain circumstances embalming may be required, such as a public visitation.